Precarious work can be defined, in a general way, as a lack of security in employment that affects multiple dimensions such as the contract period, the labor rights, the wages, and the employment relationship. In the last years, we are going through a period of economic and humanitarian crisis. Wars, refugees, hunger, etc. are the real main problems that our society is facing nowadays. The United Nations (2018) has launched an initiative known as the Sustainable Development Goals (SDG), which is composted by a total of 17 objectives which main goal is to deal and improve the current situation. This initiative was born in 2015 when the worldwide leaders agree a set of objectives to eradicate poverty, to protect the planet, and to ensure a sustainable development. Specifically, it was in 2016 when it comes into force until year 2030. Before SDG the United Nations also carried out another initiative known as the Millennium Development Goals (MDG) which was composed by eight objectives. Focusing on the SDG, their main aim is to achieve a sustainable and inclusive development through the consecution of the 17 goals which are in Table 1. This entry is focused on the analysis of precarious work in Europe. The International Labour Office (2011b) explains as the concept “precarious work” is challenging to define precisely due to the differences between countries which have different regulations and social structures. Blustein et al. (2016) explain as based on Benach et al. 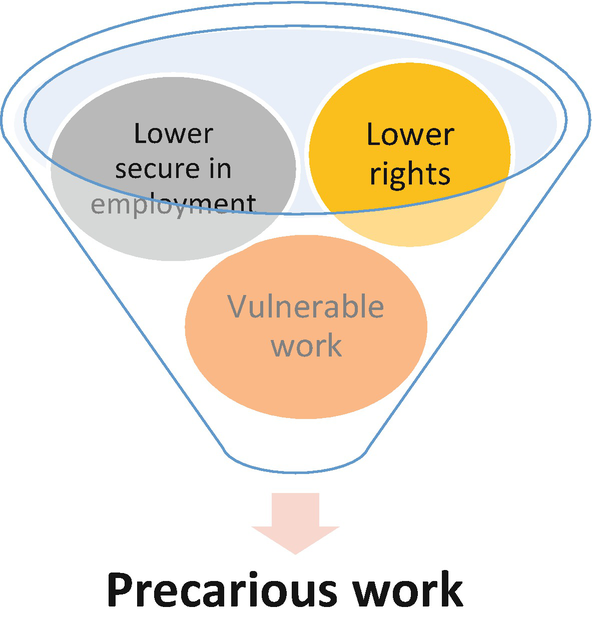 (2014) precarious work is composed by four elements: insecurity in terms of employment, vulnerability (lack of power to exercise rights), the level of protection, and the level of income. Workers on temporary contracts with variable durations directly employed or hired through an agency. A lack of trade union rights. Broughton et al. (2016) have also published a report where the starting point for the analysis of the precarious work is based on the conceptual framework elaborated by Olsthoorn (2014). In this, three main components are highlighted: the first is the lower level of security in employment (work obtained through a temporary agency, short-time contracts, etc. ), the second is the fact that rights are vulnerable (e.g., lower economic subsidies), and the third is related with the vulnerability of the work (e.g., lower incomes) (Fig. 1). In terms of contractual agreements, the duration of the contract (which is limited: fixed-term, short-term, temporary, seasonal, day-labor, or casual labor) and the nature of the employment relationship (triangular and disguised employment relationships, bogus self-employment, subcontracting, or agency contracts) are the main characteristics of precarious work. On the basis of these contributions, a general definition of precarious work can be shown. It can be seen as a lack of security in employment that affects multiple dimensions such as the contract period, the labor rights, the wages, and the employment relationship. Precariousness in employment. This is a concept which contains several dimensions related to specific characteristics of job which trigger insecurity, such as a weak regulatory protection, low wages, and low levels of control over wages, hours, or working conditions from the perspective of employees. Precarious work. It is referred to those jobs that accumulate several dimensions of precariousness, such as nonstandard jobs or the so-called bad jobs. Precarious workers. It is making reference to those individuals with precarious works, affected by the consequences of precariousness. Examples: migrant workers with physically difficult or dangerous jobs or underemployed young workers in order to have work experience and prove their reliability. Precariat. This is linked with the group of precarious workers which are an emerging class, due to the increase of people in this situation. Precarity. This concept describes a widespread condition of social life, associated with the uncertainty and instability that suffer the precarious workers. It can be extending to other areas such as housing, welfare provision, and personal relationships. The hyper-precarity relates to severe forms of labor exploitation suffered, for example, by migrant workers. Taking into account this context, the main objective of this entry is to analyze each one of these levels in order to obtain some conclusions that could shed light in the design of better future policies in terms of the SDG, specially, considering that one of the SDG is related with the promotion of decent work. The rest of the entry is organized as follows: The second section deals with the question of the precariousness in employment. The third section analyzes precarious work and the fourth section precarious workers. In addition, the fifth section studies the precariat while the sixth section is focused on precarity. This entry ends with a discussion of some important conclusions in the last section. Considering these dimensions, it is important to review the role of labor regulation in precariousness in employment. The labor market situation has developed substantially in the last decades. However, the legislative frameworks failed to follow this development, allowing a substantial increment in precarious work arrangements (International Labour Organization 2011b). Both national and international labor regulations have weaknesses, omissions, and gaps. Some specific categories, such as agricultural and domestic workers, are often excluded from the protection of labor legislation. In other cases, the use of temporary and subcontracted labor is not sufficiently restricted. Moreover, access to trade union rights is limited, due to the practice of hiring temporary and subcontracted workers and due to the legal limits of workers to be members of trade unions, for example. Analyzing the legal factor at national level, International Labour Office (2011b) suggests that one of the law factors that can contribute to the expansion of precarious work is the type of work relationship. Some examples of precarity within an employment relationship are identified below. Low income. Countries with a wide low pay sector generally have neither comprehensive collective bargaining coverage nor statutory minimum wages. This situation is becoming noticeably worse during periods of high unemployment. Weak labor regulatory. Weak enforcement of labor law has serious consequences for workers. Even if they are protected, they feel precarious. This situation comes most often in governments that separate the regulation, the implementation, and the labor law enforcement in different ministries. From an international perspective, there are international labor standards that seek to protect all workers. Conventions and recommendations adopted by the International Labour Conference are of general application, unless otherwise specified. The International Labour Organization emphasizes the freedom of association, the right to collective bargaining, the nondiscrimination, the abolition of forced labor, and the eradication of child labor. Besides the role of legal factors, it is also necessary to consider the role of economic drives of precarious work as it has also been remarked by the International Labour Office (2011b). In this sense, it is crucial to consider multiple combinations of several factors, such as the abuse of dominant economic position, the liberalization of the economy, or the increasing global mobility in the markets (in addition to mentioned before, weak protective labor laws, leading by lobbies, and some policies guided by the belief in the efficiency of free markets). Thus, in the past few years, most societies have seen an improvement in its economy. The growth in Africa, postcommunist countries, and Latin America has led to a convergence process of the gross domestic product (GDP) on an international level since 2001 (Milanovic 2012). However, the wages and salaries do not follow the same rhythm (International Labour Organization 2011b). The standard employment relationship in industrialized countries was based on labor rights, social security, rising wages, and collective representation. This standard has contributed to the establishment of a broad middle class and to the upward social mobility. Welfare-state provisions and collective bargaining have been achieved at the same time. Nevertheless, they are now in risk. With the advent of globalization, the trend of the long postwar period was reversed. Employers have started to use inexpensive labor in order to cut staff expenditures and maximize profits. In addition, they are able to hire labor on increasingly less secure contracts within formal firms. A divide et impera strategy has been (and is being) applied to undermine the standard employment relationship. In this regard, precarious work is the result of a change of the rules of the game. Currently, with the global capital mobility and the global sourcing options, it is easier for companies to relocate their operations to areas with cheaper labor or, alternatively, outsource them, which has caused a job contraction. New information and communication technology advancements, together with the falling transport costs, are contributing in this process. The theory of unemployment entrapment in neoliberal economics emphasizes that acute economic deprivation is an important stimulus for a more intense search for employment and for greater flexibility when accepting a job (Gallie et al. 2003). From this neoliberal perspective, precarious work is the solution to the job contraction. To achieve full employment, it is necessary to deregulate labor markets and make work “more flexible.” But this neoliberal doctrine needs a government that makes the social transfers conditional on accepting any kind of work, facilitating low-pay and precarious work. Therefore, this type of employment policies led to an increase in working poor. Other factors to take into account in creating the precariat are laws that allow easy layoffs; the exclusion of vulnerable groups like young people, women, or the elderly from labor protection; and the simultaneous increase of agency work and reliance on temporary workers. As a result, the employment market created over the last decades is working outside control and without an appropriate structure. This supposes a big challenge for policymakers, employers, trade unions, and other social actors. Traditionally, the responsibility was shared between employer and employee within the framework of labor and social rights. Currently, the unprotected employee bears the burden, resulting in precarity. According to the International Labour Office (2011b), to stop this trend, it is necessary to implement sustainable labor policies that allow secure jobs, which provide decent wages and working hours that are compatible with family life. There is no perfect correlation between specific types of employment and precarious work. While casual and external forms of work are growing, the growing of precarious work may be affected by many factors in addition to this. However, there are certain forms of work that have a high correlation with the increase of precarity, such as temporary employment, specifically fixed-term contracts, and temporary agency work (International Labour Organization 2011b). What has been the evolution over time of precarious work? Focusing on the temporary forms of employment, they are increasing alarmingly. Figure 2 shows as since the 1980s, there is a trend to increase the percentage of temporary workers both in European Union (EU) and in the OECD (from 8–9% to 12–14%). This trend is increasing until 2006–2007, and after this period, a slight decrease is observed. It is surprisingly that nowadays the percentage of temporary working has no suffered important decreases. In addition, it is also important to emphasize that the economic crisis does not seem to have had importance in terms of temporal contracts. The problem is moving toward an employment arena in which employers only provide a permanent work to core workers, while all other employees have no security, low wages and benefits, and a miniscule chance of professional advancement (International Labour Organization 2011b). When talking about temporary employments (one of the types of employment over the category of precarious work), it is crucial to consider whether this work is chosen voluntarily or on the contrary whether it is an involuntary situation. Table 2 shows as the percentage of employees that could not find a permanent job in the EU has been increasing over time with a 4.6% in year 2002 and a 7.8% in 2017. Once again, the past economic crisis seems not to be behind these numbers because this increase took place in year 2006. Another important and worrying issue is the percentage of employees with temporary jobs because they could not find a better job. In this case the trend is the same; in year 2002 around 37.3% of the population in the EU was in this situation, while in year 2007, the percentage is about 53.9%. This means than more than the half of individuals with temporary contracts are in this situation because they are not able to find better jobs. Thus, the increase was preferably involuntary. The employees must choose this option because no better work is available. At this point, it is important to note that according to data from the Eurofound (2017), the workers with permanent contracts report more favorable job quality, in general, than workers on temporary contracts. Although the number of temporary involuntary jobs seems not to be affected by the financial and economic crisis of 2008, during these years it was easier for companies to adjust the number of temporary workers and their hours than the number of employees with permanent contracts (Vandekerckhove et al. 2012). In a country-by-country analysis conducted by the International Labour Office (2011b), Western Continental Europe countries have increased the temporary forms of employment ranging from about 3% for Austria, Belgium, Luxembourg, and Germany to 16% for Spain, with Portugal, France, Italy, and the Netherlands standing between 5% and 9%. Scandinavian countries showed stable or slightly declining rates over that period. On the other hand, Central European countries suffered an increase over the period. Greece and Turkey have a declining trend, having started at around 20% in the 1980s, with shares hovering around 13% in 2007. In order to analyze the evolution of precarious work in the strictest sense, Eurostat (2018a) provides the percentage of workers that are in this situation since year 2002 to year 2017. Thus, in 2002 around 1.6% of workers were under a precarious situation, while in year 2005, this percentage increases to 2.3%, and this number is maintained until 2017. Analyzing the geographical differences nowadays (year 2017), Croatia and Montenegro have the higher rates of precarious work in the EU (over 7%), followed by Turkey (6.4%) and Slovenia, France, and Spain (about 5%). Attending to differences between economic sectors, Table 3 shows the data provided by Eurostat. It highlights the “Agriculture, forestry, and fishing” sector as having the higher percentages of precarious work in the EU. Another point to have in mind when focusing on the social aspect is that part-time jobs may be precarious, but not in the same way for all people. For example, it’s not the same for a student who combines school and a part-time job as to the head of the household who depends on employment to keep the family afloat. The impact in their lives is especially relevant in the presence of social conditions, such as the dependence of full-time workers on the wage for their subsistence, family relations, social norms, education, and the welfare regimes (Campbell and Price 2016). Social relations outside the workplace and the action of institutions may imply different effects on workers. The welfare-state payments in order to reduce the risk of poverty could be considered a positive effect. On the contrary, an example of a negative effect could be immigration rules that position workers in a precarious status. Regarding agency workers, Convention No. 181 (1997) favors their access to their fundamental rights at work improving their working conditions, although does not limit the use of this type of workers. The Part-Time Work Convention (1994) (No. 175) seeks for part-time workers to receive the same protection as full-time workers. Part-time employees should benefit from conditions equivalent to maternity protection, end of contract, paid annual leave and paid bank holidays, and sick leave. This convention also seeks to protect workers against involuntary part-time, promoting initiatives aimed at preventing workers from being trapped in part-time employment. Table 4 presents the percentage of temporary employees by age and as it can be seen younger people are the most affected by this type of employment. Therefore, during the last year and according to the data of Eurostat (2018c), it seems that younger people are becoming the new precariat class. Both precariousness and precarious work are related to labor insecurity. The employers are taking advantage of the weak labor regulation to reduce labor costs and the quality of employment. And the consequences for precarious workers may range from a decrease of physical, mental well-being to the decline of other aspects of social life linked to paid work (Campbell and Price 2016). Paid work is relevant for the quality of life because of the income but also because it provides identity to people and opportunities to socialize with others (Stiglitz et al. 2009). The new economy approaches focus the attention on those objective characteristics on which people’s quality of life depends. These characteristics include the personal activities, and decent work is within these. It is necessary pointing to the high costs of involuntary unemployment for people’s quality of life. In addition to income, nonpecuniary effects of job instability (sadness, stress, and pain) among the unemployed and of fears and anxieties generated by unemployment in the rest of society must be mentioned (Stiglitz et al. 2009). Most modern societies are faced with an accelerated urbanization process. Population groups of different origins and cultures move to cities in search of better opportunities. However, in many cases, they are forced to accept those jobs that nobody wants. According to Peter Drucker, the problems of social minorities originate in the lack of a position and a social function. He argues that the way to integrate into the group is through the property or the contract. In this way, employment is one of the mechanisms to obtain a position and a social function (Stein 2008). Between these population groups are the migrant workers. These individuals suffer a considerable job insecurity: they have higher unemployment rates, and when in employment, they are frequently segregated into low-paid, unskilled, and precarious employment. Table 5 shows data available regarding the lack of opportunities for these people in access labor market in EU countries. Fewer opportunities for training, language barriers, limited access to the public sector and to managerial positions, ethnic prejudices, legal barriers, and discrimination by colleagues or educational qualifications are some factors that contribute to the hyper-precarity of migrant workers. Finally, it is important to remark that due to the crucial role played by migrant workers in the economic growth of countries, Eurofound (2007) recommends paying more attention to their employment and working conditions. Different countries in the world present the same characteristics: wage employment is increasing, but with more insecurity for the employees. In this situation, labor protection laws play a crucial role. In countries with the absence of permanent forms of contract, the employers can abuse workers’ rights because the employees’ main goal is the renewal of contract. The fear leads to workers not to join trade unions, increasing their vulnerability to precarious work arrangements. Therefore, it is necessary to include the labor market policies in a broader set of measures, which must be consistent and complementary. Even under the current globalization regime, it is possible that countries improve social economic outcomes with this type of policies. Through the literature review conducted in this study, it has been found that the achievement of a full employment should be considered as one of the main economic goals (ILO 2011b). Therefore, policymakers should consider that fiscal and monetary policies could help, for example, reducing the financial market volatility, strengthening progressive tax structures, and investing from the public administration aiming to reach the socioeconomic equity and sustainability. Previous studies also remark that the collective bargaining favor the wage growth and the importance of limiting temporary contracts that should only be used for peak periods of labor demand. It is important to note that achieving good working conditions is crucial to provide universal access to education, health, and care facilities.